Senior wet food recipe features real chicken as the first ingredient for the protein needed to support healthy, lean muscles. 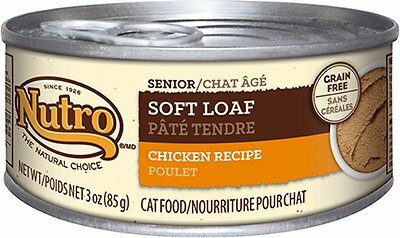 Soft, tender and highly-digestible loaf pate with smooth texture is perfectly lap-able and easy for senior cats to eat. Chicken, Chicken Liver, Chicken Broth, Pork Broth, Natural Flavors, Guar Gum, Minerals (Calcium Carbonate, Potassium Chloride, Ferrous Sulfate, Zinc Oxide, Copper Proteinate, Manganese Sulfate, Sodium Selenite, Potassium Iodide), Sodium Phosphate, Fish Oil (Preserved with Mixed Tocopherols), Vitamins (Choline Chloride, Thiamine Mononitrate [Vitamin B1], Vitamin E Supplement, Niacin, D-Calcium Pantothenate, Pyridoxine Hydrochloride [Vitamin B6], Vitamin A Supplement, Vitamin D3 Supplement, Biotin, Vitamin B12 Supplement, Folic Acid), Salt, Taurine. To feed alone: Feed an 8 lb cat about 2 cans daily. I've been searching for a very soft pate that my senior cat, with painful mouth issues, can lap up. 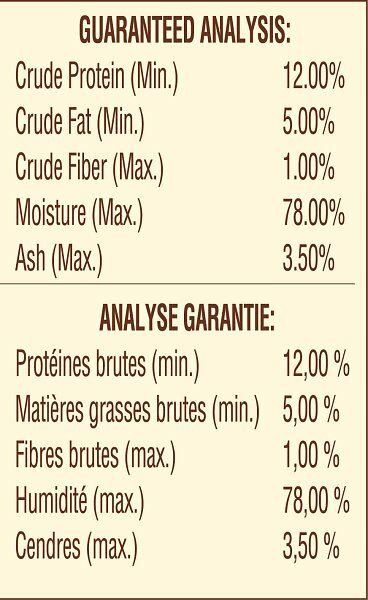 Nutro soft loaf is very soft and moist, unlike other pate's which are finely ground but ofter drier and difficult for her to pick up. Only one local store carries it so I was happy to be able to purchase a case on Chewy. After a long time on science diet senior food, our 17 year old cat Minou started throwing up more often. After doing some research we found the rice and grain in her food was the likely culprit. After switching her to this food she is much better. The only problem is she likes it so much she can't get enough. I have been trying to find some food for my senior cat that she can/will eat. I have tried several different "pate" type foods, she basically licks the food and pretty much only eats the gravy part. The "Soft Loaf" is just that - it is really soft and my senior girl eats the whole thing!!! I just wish it came in other flavors - I'm afraid that the queen will get tired of the same thing every day. I have not found any other foods that are a soft and lickable as the Nutro soft loaf. I noticed in just one week a huge difference n my almost 11 year old cat. He was more playful, energized, and added a bit of weight that he had lost rather rapidly. He loves the food so it is not difficult to feed him. Great product. This Nutro Soft Loaf is highly rated for senior cats, and my 18 year old cat wants to eat it all day long! This was my first order through Chewy, and I was disappointed in one thing. See below. This got our senior cat eating again! We had been having trouble with one of our senior cats (16 yrs old) not eating much or at all. We had tried numerous different types of food, both dry and canned, but once Punkin tried this, he hadn't looked back! He's back to wanting to be fed and eats it faster than anything he had in the past. It even helped our 17 yr. old cat to live just a bit longer because it blended into a smooth paste that he could eat easier than any other blended cat food. 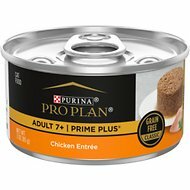 I HIGHLY recommend this food for anyone with senior cats who are finicky about what they eat. My 17-year-old senior cat LOVES this food. I mix it with rabbit pate and grain-free shreds to give her a little variety. 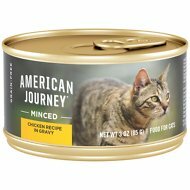 After years of preferring "kitty junk food" (a major name brand canned food), I switched her to this food. It was an easy transition, and I was able to expand and improve her diet from here. I still feed her one can of this per day in combination with other foods - love it! My vet recommended a senior diet for my 16 old Siamese in early renal failure. He had been losing weight but loves this and has even put a bit back on. My cats like fishy flavors best but this is a chicken flavor they like a lot. 2/3 of my cats will eat this so it's a good chicken flavor in between the fishy food.